Bestselling writer Marcus Sedgwick is also a committed shedworker. Here he is writing on his blog about his garden office (click the link for lots more interior shots). 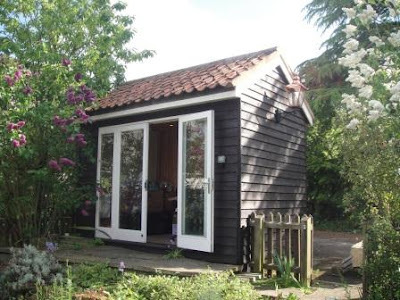 "A few years ago I moved back to Cambridge: when I saw this shed in the garden of one of the houses I was viewing, I put an offer in on the spot. Like most writers, I’ve had to work in all sorts of inappropriate spaces, and, like most writers, always craved the perfect place to work. My shed is near perfect. It’s a little on the small side, but that just means I have to tidy up from time to time, which is no bad thing." 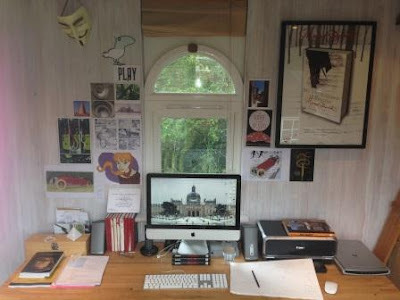 The space in my shed I see as an exterior manifestation of my imagination – at any given time the walls are heavy with clippings, doodles, photos and words all connected to whatever book I’m working on. And yet, I’m aware that while writing, I might be physically in my shed, but some part of my mind is travelling again, to those places that inspired the story.